Providing you the best range of jominy quench apparatus with effective & timely delivery. Our company is one of the renowned names in the industry that manufactures of qualitative range of Jominy Quench Apparatus. We make use of precision engineering techniques and quality raw materials to produce this range at par with international quality standards. These are also offered to our clients at competitive prices and also customized as per the specifications provided by them. The quenching fixture designed strictly as per specification like 45° angle of top plate, quenching distance, jet stopper release just before quenching etc. Motorized Water circulation through water pump with storage and test tank. 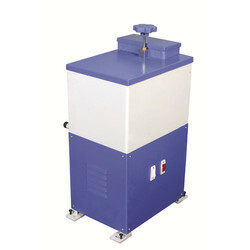 Looking for Industrial Apparatus ?